Many people collect railroad memorabilia as a way to have something tangible related to history of their favorite railroad. Collectors love rarities and collectors love items that are easy to display in their man cave or train room. There is likely nothing more displayable than a colorful poster or fresh looking porcelain sign. Our guide will help you determine if your old railroad sign or advertising poster is worth $25 or $2,500. This is absolutely the most important factor related to valuing a railroad poster or sign. You have to remember that signs and posters were never “one-off” items. They were ordered in large quantities. For example, if a railroad was doing a promotion, they might order two posters for every depot, and ten posters for every train. The numbers really added up. There is a huge price gap between a sign in truly mint condition and the same sign in damaged condition. For example, a really lovely but relatively common sign might sell for around $1,000. A faded, chipped, and bent version of the same sign will probably only be worth around $75. The same thing applies to posters. Paper is easily damaged. If the poster isn’t attractive then it will have a limited value to collectors. It is difficult to easily determine what is rare. You can’t assume that because a simple internet search did not produce results that a railroad sign or poster is rare. Many railroad items are held in collections and don’t openly trade on the internet market. Rarity is very important though. Despite print runs of 500, some posters can be unique or one of only a handful of survivors. Truly rare posters can sell for thousands of dollars. Signs have better survival rates because metal ages much better than paper. Porcelain signs top out at around $3,000 even for the rarest signs in amazing condition. It is best to contact an expert (like us) to determine if your sign or poster is especially rare. There are no tricks to figure it out on your own. This is one of those things where you really just have to have an eye for what’s good and what is going to sell. You need to analyze the colors, fonts, vignettes, and advertising location. If you get the right combination of all three then you have a real winner. 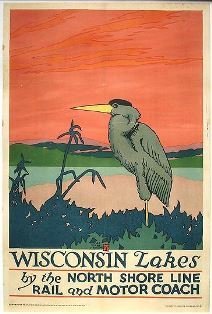 Railroad posters and signs were often exposed to the elements (rain and dirt) when originally displayed or to sunlight when displayed by a collector. Colors can easily fade. The best posters and signs will have bright original colors. When it comes to fonts, many collectors are looking for typeset that is evocative of the old west. Your typical block or sanserif font isn’t going to raise anyone’s pulse. However, if you throw in a coffee can or circus poster font then you are definitely going to get more interest from buyers when it comes time to sell. The most important determining factor of the value of a railroad poster is related to its vignettes. Simply put, what new location or route is it advertising? There is no simple answer as to what is popular; but when you see it you should know. Antique railroad posters should all be linen or paper. Signs come in several varieties and there is definitely a hierarchy in terms of what collectors want to buy and what has the most value. Without question, porcelain signs are the most valuable. You can tell if you have a porcelain sign because the surfaces should be slightly raised where the colors change. You will also see a lot of painted tin signs. They can be attractive, but they are nowhere near as popular as porcelain signs. Painted wood was used occasionally. However, those types of signs generally aren’t considered advertising. The worst thing about trying to collect antique railroad signs and posters is trying to navigate through all of the reproductions that are on the market today. Unfortunately, probably 95% of the railroad signs you see for sale are cheap reproductions. The good news is that they are usually marketed as such. The same thing goes for posters. You can make a fake poster with just a good copier. If you are considering collecting then we would advise working with a reputable dealer who is known to deal in authentic signs and posters. Antique railroad posters and signs are absolutely some of our favorite types of railroadiana. Just like everyone else, we love unique and colorful conversation pieces for our offices. Please feel free to contact us whether you are looking to sell a single item or entire collection. We are definitely interested buyers. Send us some pictures of what you have and please remember to include dimensions. We will respond quickly with our offer.